Asiatica Travel has been our dear friends since 2010 when we did our first trip to Vietnam, using their services. We then used Asiatica again in 2014 when we visited Cambodia and now have just returned from our third trip arranged by Asiatica, this time back to Vietnam, a country we have fallen in love with. From the time you start the initial e-mail correspondence until the time your tour guide first meets you at the Airport, we can only note that we have received very professional and courteous service from all the Asiatica Travel staff we have ever dealt with. Special thanks must go to Ms Linh Doan, our travel consultant who put our exciting trip together. Everything we asked for, was catered for in our Itinerary, with suggestions from both sides in order to get the most out of our holiday, and especially important for us, was value for money. Also special thanks to Ms Linda who looked after us so well, once we arrived in Vietnam. We were excited to visit the Asiatica Office in Hanoi and meet all the great staff – it is so nice to put a face to the name on the email. We enjoyed some refreshments and received some lovely gifts from Asiatica. Thank you! This time we visited the places we fell in love with on our first trip, but did not visit the same tourist attraction in each city. We asked for some “free time” wherein we discovered the city on our own. We were also taken to other sites and places, which we had not seen on our first visit, which was great. 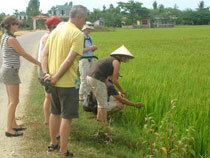 We started off in Hanoi, meeting our guide for the first part of our trip –Mr Bui Cao Thanh – “T’ to us. We really enjoyed being with “T” and had so much fun with lots of laughs. He was very knowledgeable and always took his time to explain the history of the areas we passed through and visited.He was fluent and confident with his use of the English language and went out of his way to make us feel comfortable, and as we are “older” travellers, the heat and the humidity and the physical conditions were sometimes hard, and “T” always showed his concern for our wellbeing. We enjoyed Hanoi and our hotel near Hoan Kiem Lake was very comfortable. We went to the Lotus Water Puppet Show which was very entertaining and this was followed by an amazing Vietnamese meal at Madame Hien, hosted by our friends at Asiatica, Linda and “T”. Our driver was an excellent driver and was very nice as well. We felt completely safe with him at all times in the lovely air-conditioned vehicle which we used for our time in Northern Vietnam. The next part of our trip was an adventure! Central Vietnam had just experienced a typhoon – and the tail of it hit the Ninh Binh area the day we arrived. Pelting rain did not stop us from going on our boat ride on the lake to see the beautiful Thien Ha caves. Onwards to our overnight stop at Tam CocRice Fields Resort. More torrential rain had flooded the area and what an experience taking our shoes off and walking through the waterlogged hotel grounds to our room! The staff at the hotel had never experienced such rain before, so we were all in it together! We slept well that night and look at it as being a “once in a lifetime” experience. Onto Halong Bay for our 2 night cruise. As we had been there before, we enjoyed some relaxing time as well as our visits to the Sung Sot Cave and the Tunnel Grotto. We also enjoyed swimming at the beach in the middle of Halong Bay and having some fun kayaking. The scenery with the beautifulsunrises and sunsets is breath-taking and is well worth a visit. A great number of photos were taken here. Sadly it was already time to say goodbye to our Guide and Driver who really gave us a good time in the Northern area. We flew onto Da Nang and were transferred to our beautiful hotel – Hoi An Silk Boutique hotel where we spent an amazing 5 days in which we visited the Old Town many times and even went to An Bang beach per kind favour of the hotel shuttle. The sea was very warm and we enjoyed the time spent at the beach. We also had a fun morning doing a Cooking Class at the Red Bridge Cooking School. The Chef was very entertaining and the staff were so friendly – we certainly learnt a bit about Vietnamese cooking and hope to put some of the recipes we used, into practice back home in South Africa. Well worth the visit to Red Bridge! Highly recommended. Our last stop on this amazing Vietnamese journey was a short two night stop in Ho Chi Minh City and once again the hotel was very central to our needs – close to the Ben Thanh market and shopping areas. We had a very interesting Cyclo Tour around the various markets in the City, with our Guide – this was also an experience as the Cyclo drivers do not worry about the hundreds of motorbikes and cars – the crazy traffic, they just pedal away! Lots of photos were taken here too! And all too soon, our wonderful holiday in the beautiful country of Vietnam came to an end. We will always remember the many friends we have made with Asiatica staff over the years and thank them for their kindness, enthusiasm and professionalism at all times. We really had an amazing, fun holiday, filled with wonderful memories and happy times which we shall cherish in the years to come. We can highly recommend Asiatica Travel who will plan an amazing holiday for you in South East Asia. THANK YOU ASIATICA TRAVEL FOR MAKING OUR DREAMS COME TRUE! WITH MUCH LOVE FROM YOUR SOUTH AFRICAN FRIENDS!